But maybe Alonso does not recover in time for Australia, in which case it makes sense to give a little running time to Kevin Magnussen so that it's not the first time he's driving the car in Australia. Ericsson improves to a 1:24.610 on the super-softs. Thinking about it, Sauber has had quite a nice series of testing for themselves as well as the ferrari engine. Many laps completed, performance does not seem miserable. Who makes the seals that McLaren are having problems with, is it Honda or McLaren or an outside supplier or are they standards seals they use for all F1 teams ? @MrTuK: Honda in this case. Although reports suggest McLaren manufactured a temporary one for use this week. Every midfield team making progress. Really hope SFI can complete 300-400 laps on the two and a half days that they have, otherwise the’ll be hoping for a Manor return to save themselves from the last row. @Rob: I think 300-400 laps would be ambitious with a brand new car in two and half days. But some mileage is better than no mileage at all. Raikkonen and Sainz on track now. Kimi continues to pound round on the hards while Sainz is on mediums. Ericsson has returned to the pits after that super-soft effort. @ankur: It depends on aero. One of the biggest reasons we don't see cars slide is not a lack of power but a lack of mechanical grip v aero grip. 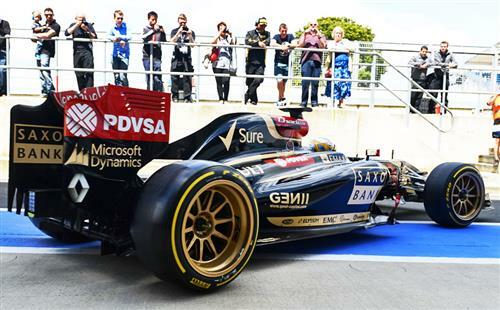 If fatter tyres offer more mechanical grip then, oddly, we might see drivers be able to lean on the tyres a bit more. @Keith: That is also being considered. What happened about getting 18 wheels rims ? @MrTuK: Halfords ran out of stock.